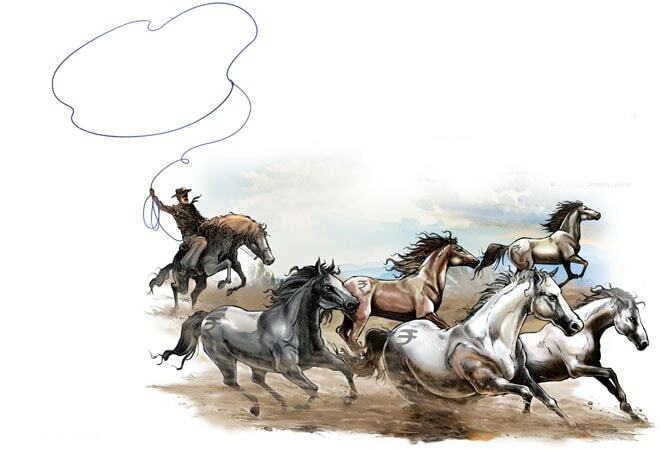 Sebi cracks the whip on four companies that seem to have been rigging the share prices. It is not often that one hears about 239 entities and individuals being barred from a stock exchange by the regulator. But this is exactly what the Securities and Exchange Board of India, or SEBI, did on June 29 after its probe found that the Bombay Stock Exchange's (BSE) SME platform was being used to turn unaccounted money into legitimate market gains. The banned entities include four companies at the centre of the alleged fraud - Eco Friendly Food Processing Park, Esteem Bio Organic Food Processing, Channel Nine Entertainment (CNE) and HPC Biosciences. The others include those that were allotted shares by these companies in preferential allotment and pre-IPO placements, and those that funded the purchase of such shares. "The scam will hit the confidence of investors in the exchange, impacting the ability of SMEs to raise funds," says Jay Parikh, Partner, Shardul Amarchand Mangaldas, a law firm. SMEs employ 40 per cent of India's workforce and contribute 45 per cent to its manufacturing output. "The SME Exchange enables any company that needs capital to raise money, but the difficulty is in bringing in investors. Why would you invest in companies you are not sure about? "says Chirag Jain, Vice President, Merchant Banking Division, Ashika Capital. A total of 101 companies have so far raised close to Rs 1,000 crore on the SME platforms of both the BSE and the National Stock Exchange (NSE). The platforms were launched in 2012 to give small companies access to capital. The four companies at the centre of the storm were listed on the SME platform of the BSE between January and March 2013. What raised eyebrows, says SEBI's 80-page ban order, was the sharp rise in their shares between January 2013 and December 2014. For instance, Eco Friendly shares rose 6,265 per cent between January 14, 2013, and December 31, 2014. Similarly, Esteem Bio's shares rose 3,150 per cent, while that of Channel Nine and HPC rose 2,882 per cent and 1,782 per cent, respectively, between the middle of January 2013 and December 31, 2014. 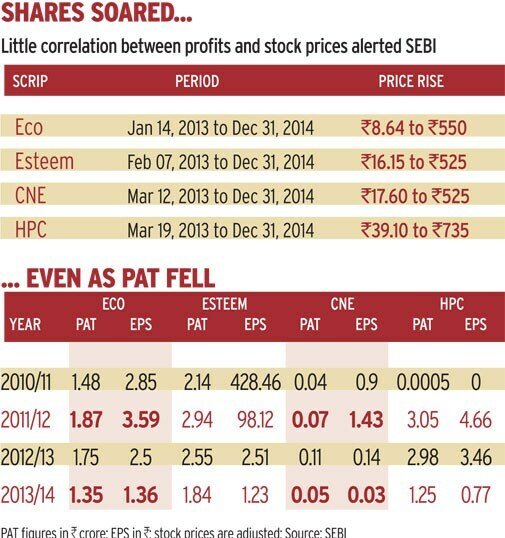 All this, despite the dip in profit after tax, or PAT, of these companies (See...As PAT Fell). Eco Friendly, Esteem Bio and HPC are into cultivation, processing and distribution of agricultural products. Channel Nine is a producer and distributor of television serials, films and events. BT's attempts to contact these companies did not yield any result. Interestingly, Kolkata-based Guiness Corporate Advisors was the lead manager for all these four issues. Despite their poor financials, these four companies raised funds through a series of preferential allotments to several entities. They also issued bonus shares. At the IPO stage, says SEBI, a group of entities it calls the Funding Group - linked to entities that got shares in the preferential allotment - financed a big chunk of the offers. The companies collectively raised Rs 46.53 crore from their IPOs. Out of this, more than Rs 19 crore was provided by the Funding Group. However, instead of using these funds for reasons listed while tapping the primary market, the companies transferred Rs 30 crore (more than 50 per cent of the proceeds) to entities of the Funding Group either directly or through layering, says SEBI. Thus, they concealed the diversion of the IPO proceeds from the stated objectives, which is a violation of SEBI's listing rules. The SEBI order further says that after the shares of these four companies listed on the SME platform, some entities, called the Trading Group, manipulated the price and volume of the four scrips and provided a profitable exit to preferential allottees and pre-IPO transferees. "The funds required for purchase of shares by the Trading Group entities were provided to them through layering of fund transfers from several entities, including the entities of the Funding Group," it adds. "The acts and omissions were prima facie for generating fictitious LTCG (long-term capital gains) so as to convert unaccounted income of preferential allottees and pre-IPO transferees into accounted one with no payment of taxes as LTCG is tax-exempt under Section 10(38) of Income Tax Act, 1961," says the SEBI order. Consequently, the preferential allottees and pre-IPO transferees collectively made a profit of Rs614 crore, it says. Experts say many companies are using the SME Exchange to enter the main board. 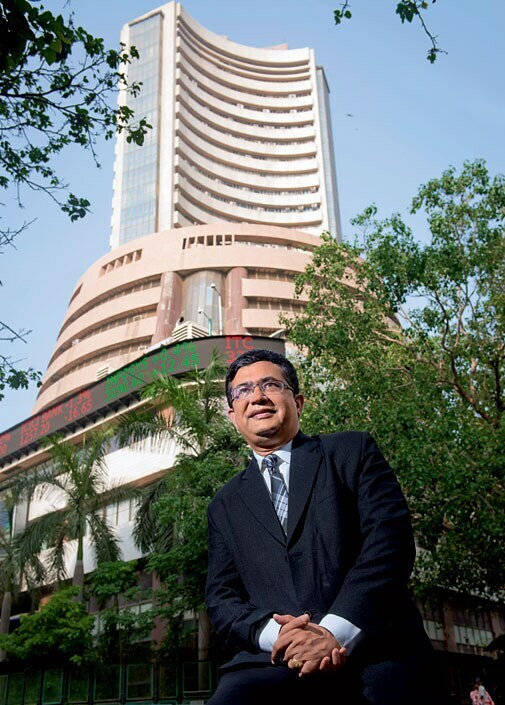 "Many companies are using the SME Exchange to get listed as it's a prestigious thing and enhances their valuations," says Saurabh Agarwal, Director at Kennis Financial Services, a Mumbai-based wealth management company. Take Anshu's Clothing. It listed on the BSE SME platform in October 2012 after raising Rs5.05 crore. It graduated to the main board in just two-and-a-half years. What raises eyebrows is that the money was raised to give long-term advances, which is not a usual practice in the apparel business. Further, when it hit the market, it had a profit of Rs 50 lakh in 2011/12. This fell to Rs2 lakh in 2013/14. The company switched to the main board even as the stock shed 50 per cent of its value. The BSE Sensex rose 50 per cent during the period. Interestingly, after its entry on the main board, the company has posted a loss of Rs21 lakh on a revenue of Rs 38 lakh in 2014/15. Indeed, it's easier to get listed on the main board via the SME Exchange route. Any company that wants to be listed on the main board must have posted a pre-tax profit of Rs 15 crore on an average for at least three years. If not, 75 per cent issue must be subscribed by qualified institutional buyers. But a company listed on the SME platform can migrate to the main board after two years if its paid-up capital is Rs10 crore or more. If it had not been listed on the SME Exchange, given its financials, Anshu's Clothing would have never made it to the main board under SEBI regulations. An email to the company did not elicit any response. Experts say misuse of the SME Exchange shows that there is a need to make systems more robust. "The LTCG game also happens in companies listed on the main board. For that one cannot hold the whole exchange as faulty. There must be checks and balances. 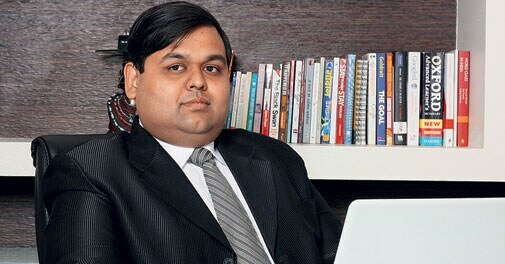 One way to check misuse is to broad-base participation by mandating anchor investors," says Mahavir Lunawat, Managing Director, Pantomath Advisory Services, a Mumbai-based financial services firm. Companies with sizeable investments from institutions have given stable and steady returns. For instance, Ashapura Intimates, with substantial investment from Small Industries Development Bank of India (SIDBI), or SI VI Shipping, in which Edelweiss has picked up a stake, have given decent returns with much less volatility. "Participation from big banks can make a big difference. They will bring quality companies which will give confidence," says Ravi Varanasi, Chief, Business Development, NSE. 'Many companies are using the SME Exchange to get listed as it's a prestigious thing', says Saurabh Agarwal, director, Kennis Financial Services. 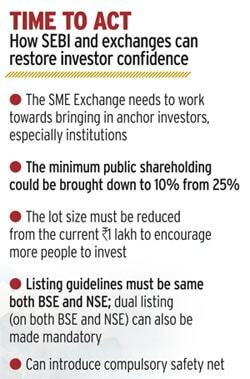 Another way to widen the investor base could be by integrating the markets and making it mandatory for the SMEs to list on both the BSE and the NSE. Exchanges have already taken steps to improve credibility of their SME platforms. The NSE, for instance, asks Crisil to evaluate companies before taking them on board. "We verify each company through a credit rating agency," says Varanasi. So far, the NSE has allowed only manufacturing companies on its SME platform. It has stayed away from financial companies. The NSE also uses quantitative factors to analyse companies before listing them on its SME platform and not just qualitative ones. "If some companies or merchant bankers are indulging in unfair practices, they should be thrown out," says BSE Managing Director Ashish Chauhan, adding that if the regulator finds irregularities, it should take stringent action against the guilty. The BSE recently changed the SME listing norms by raising the paid-up capital requirement after the IPO from Rs1 crore to Rs 3 crore as well as mandating a minimum net worth of Rs 3 crore as against the previous requirement of Rs 1 crore. SEBI, which has kept retail and small participants away from the SME Exchange by mandating strict entry norms, must also get its act together. "Lower trade size after listing and lower underwriting levels are the need of the hour. These will increase liquidity and encourage more stakeholders to look at the SME Exchange," says Pantomath's Lunawat, who feels that the minimum public shareholding in SMEs should be lowered from 25 to 10 per cent. There is often a mismatch between the valuations of SMEs and their funding needs. "We are dealing with various SMEs whose valuation is, say, Rs40 crore to Rs50 crore for a 25 per cent stake, while their requirement is 50 per cent of this or lower," says Lunawat. "SEBI needs to ensure that the public float of 25 per cent will be ensured before the SME migrates to the main board," he says (see Time to Act). Chauhan's focus is on bringing more companies to the BSE SME platform. "My vision is aligned with that of the Prime Minister, to give SMEs access to capital markets so that their growth is not restricted due to unavailability of capital. SMEs are key to job creation." SEBI, exchanges and institutional players, such as SIDBI, conduct seminars each month to encourage SMEs to tap capital markets, but there is not enough focus on quality. "It's important that the exchange generates credibility and visibility for the SME so that it also gets access to bank funds," sums up Samir Bhatia, founder and CEO of SMECorner.com, an online platform that helps SMEs get loans.